Well, we are back to having updates buffered ever so slightly, we’ll see how long we can keep that up, eh? Patreon updates should up again on time (or some approximation at least). Reading last page, there is a rule to the sport Peter missed, but it’ll likely be followed anyway (since Kally is unlikely to move and Naomi actually knows the rules to the sport). It’s that if you hold or catch the ball, you have to return to the starting position. You only lose the point if the ball has been on your side for fifteen seconds or hits the ground, but you cannot catch it and walk to the front of your court with it. This doesn’t necessarily mean that you have to take the ball back there, merely that you personally have to be that circle. The farther away you activate your magic from yourself though, typically speaking it’s both weaker and more subject to interference. We got a new Patreon! Thank you! I’m sorry that I don’t have the bandwidth to put out a bonus page in celebration quite right now, but I’m always deeply appreciative that people support the comic there! I’m still looking forward to hitting the first goal! Getting more Patreon content (in addition to any goals and reward tier stuff) is definitely something that I’m working toward. Kally must have nerves of steel after seeing Naomi’s smile and following expression, I am sure there are demons with more calm and less scary expressions than her. Of course I like Naomi anyway but I really wouldn’t want to be on the other side of her in a battle or competition. I predict that someone will get a point by gettting the ball vertical and dropping it just inside the net on the opponents side. A tap over as it were or maybe a drop onto the net with a tap over. Spoilers man, spoilers! 😛 Unless I’ve just spoiled it by calling it spoilers? Scratch the whole conversation from the record editor! … That didn’t help. We’ll have to see! I vote C. Any chance that they could be alien robots? In panel 4, Naomi has a certain… shark-like appearance about her. Like she’s going to rip the ball to pieces next time it comes around. Naomi’s idea of ‘have fun’ and ‘thoroughly destroy’ do seem to be a little… ah… mixed up. Since destroying the ball is bad, we’ll see if she can restrain herself (…or hope the ball is pretty tough). Or at least the hair will get longer… it usually grows a few feet in action scenes somehow. The rules state that you are penalized for using magic on your opponent’s side of the net. BUT, it looks like Kally used a magic wall or magic deflection on her side of the net, right next to it. Technically, that should be valid. Very clever. But, man, that still feels like cheating! I don’t care how fast Naomi is, I just don’t see how she can win if Kally can keep putting up barriers like that. That is, unless Naomi can somehow bypass her barriers. Of course… as you mention… barriers… which we’ve seen Kally make before as well… hmmm… *cough, cough*. 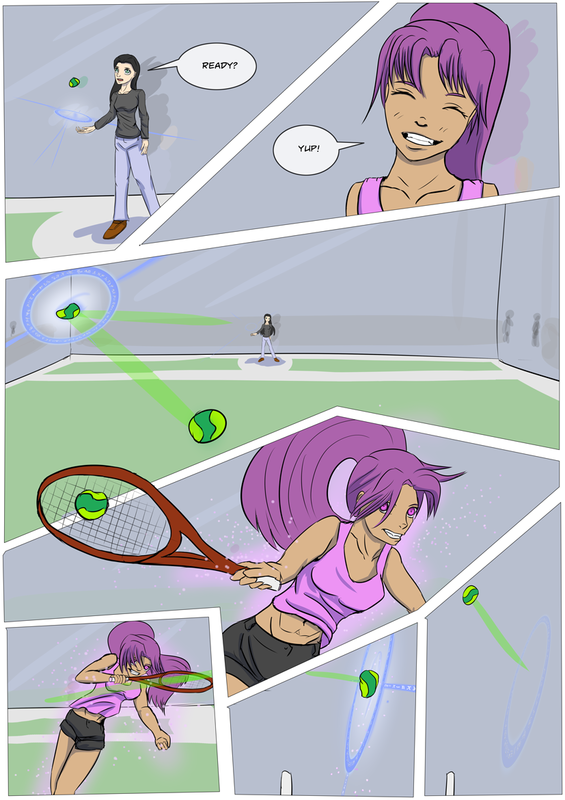 Well, with Kally using pure magic, and Naomi mostly using a racquet (so far), I’m expecting to see some frantic action with magic effects and purple blurs. I’m also going to hazard the balls are really durability little buggers.